Total Belting Solutions for your Conveyor Applications! Contact our belting experts today! CAPCORP is our belting division and we provide both lightweight and heavyweight belt, including belt modifications such as attaching cleats and V-guides, slitting and vulcanizing in house, and we send service crews out to the field to install directly on your conveyor. Our field service is second-to-none and we are proficient at getting your installation or repair with a minimum amount of downtime and hassle. We believe in local inventory, and CAPCORP is no exception! At the right you see our Fort Worth, TX stock - miles and miles of heavyweight belt ready to go at a moment's notice. We can mobilize and get you back up and running - just give us a chance to show you what we can do! 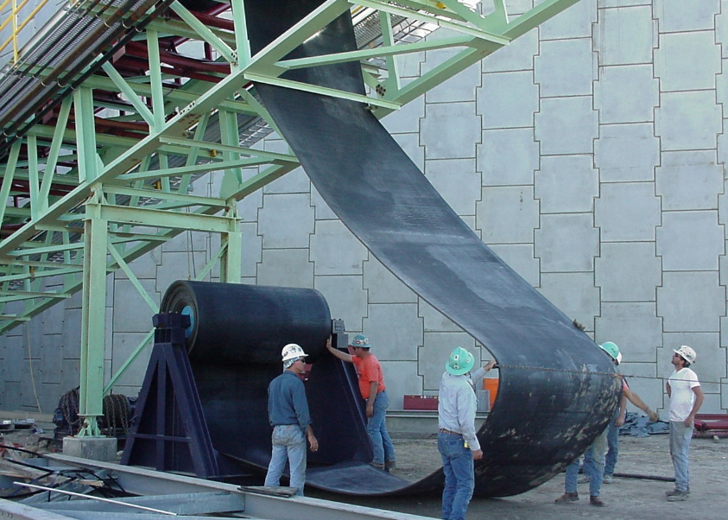 Our CAPCORP crews are experts at lightweight and heavyweight belting, from complete change-outs on conveyor belts from 10 feet to 10 miles long, to repairs on rolls of belting weighing up to 99,000 lbs. and measuring 96 inches wide. CAPCORP technicians are cross-trained to weld, rig and install conveyor belts underground or in the air. Our technicians perform daily hot or cold repairs on anything that is rubber and lag pulleys – on site or in our shop. We also offer yearly or multiple-year Conveyor Service Contracts to address regular maintenance issues. We are proud to feature Fenner Dunlop belting as our premiere heavyweight belt line. Their Rockmaster and Patriot conveyor belt brands are suitable for many aggregate and other bulk material handling applications. Whether you need a simple 2-ply 220 or up to a 4-ply 440 rating, or a custom cover, or perhaps a different carcass material, our CAPCORP belting experts can assist you in solving your toughest problem. Need a mechanical fastener or belt cleaner to go with your belt? Just ask - CAPCORP draws from Purvis' stock and we probably have what you need on our shelf! Doing a belt installation and suddenly you find you need a patch, or a few new idlers, or even a new head pulley? We can help! 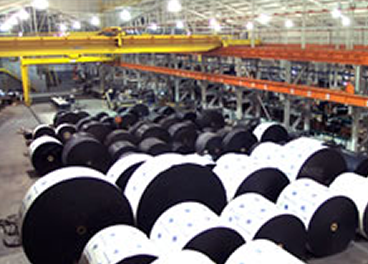 CAPCORP is also your source for lightweight conveyor belt products! 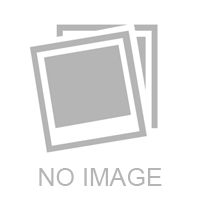 We have a wide selection of food-grade and unit handling belts from Habasit and Chiorino. We can provide many different covers in an extensive variety of materials such as neoprene and teflon. We also have different colors of belt based on different applications. Like our heavyweight products, our CAPCORP belt crews can add sidewalls, cleats, or V-guides easily to your specification. We can prepare an endless belt in our shop and deliver it to you for your crew to install, or we can provide the field service to complete the job for you!